Candidates were assessed by a panel of judges from the Harvard Club of Malaysia based on an interview covering social, intellectual and ethical aspects. This year for the interview session, shortlisted candidates were posed with questions which required them to not only think out of the box, but also to think about their responsibility in society, and their roles as citizens of the country. “It was a challenging interview, definitely had me thinking hard, but it was also very fun! Some of the questions were really unorthodox, and the interviewers built up a very casual atmosphere”, said eighteen year old Huey Ning of the interview. “I volunteered at National Zoo twice, helped out at a charity bookfair and various awareness campaigns, planted trees and had helped in painting an orphanage recently. I prepared food for animals in the zoo, including the primates and the birds. During the awareness campaign I took pledges from students and helped raised awareness on endangered animals,” said Chun Yuan who hails from Sibu, Sarawak. To be eligible for the award, candidates are required to have a consistent academic achievement of an average of ninety percent and had demonstrated exceptional contribution and engagement in community service. 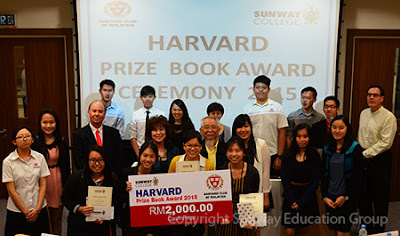 “We are certainly proud to be chosen by the Harvard Club of Malaysia, for such a prize will certainly be a boost to our students, as it recognises Malaysian academic achievers who have put in great effort and demonstrated tremendous drive and capability to excel. Through such recognition, we hope to emulate Harvard in producing great men and women who will make significant contributions not only to our society and country, but the world”, said Dr Elizabeth Lee, Senior Executive Director of the Sunway Education Group and Sunway University. 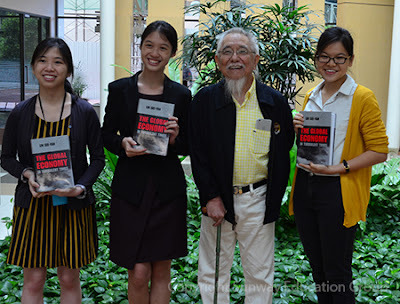 Tan Sri Lin See-Yan, President of the Harvard Club of Malaysia delivered a speech on “The Harvard Experience” where he advised students to consider what Harvard and the Americans have to offer in terms of education. Each awardee was also presented with a signed copy of Tan Sri Lin’s book “The Global Economy in Turbulent Times”. Also in attendance at the ceremony were Professor Graeme Wilkinson, Vice-Chancellor of Sunway University; Robert Boxwell of the Harvard Club of Malaysia and KC Yap from the Charles River Centre Malaysia.